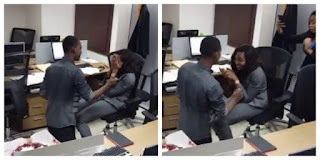 A banker proposed to his girlfriend at the bank where they both work. The young man after work hours seized opportunity, went down on one knee and asked her to be his wife. The lady, Miss Nkiru was shy and overwhelmed and covered her eyes during the proposal. Their colleagues cheered them on and we hope she said yes to him after. The lady, Miss Nkiru was shy and overwhelmed and covered her eyes during the proposal. Their colleagues cheered them on and we hope she said yes to him after.